This is a roll that I first tried and loved at the Maki Maki in Irvine, California. I liked it so much that I thought that I should try making it myself… and I was very pleased with the result! It actually tasted almost exactly like the one at the restaurant. 🙂 Yum! Makes 6 rolls, or 24 pieces. Mix imitation crab and mayonnaise, separating crab pieces and mashing into smaller pieces. If you choose to use cucumber, slice it into long, thin sticks. Using avocado sticks, cucumber(if desired), and the imitation crab mix as your fillings, roll the sushi inside-out. Cut the rolls in half and then tempura fry the inside-out rolls. 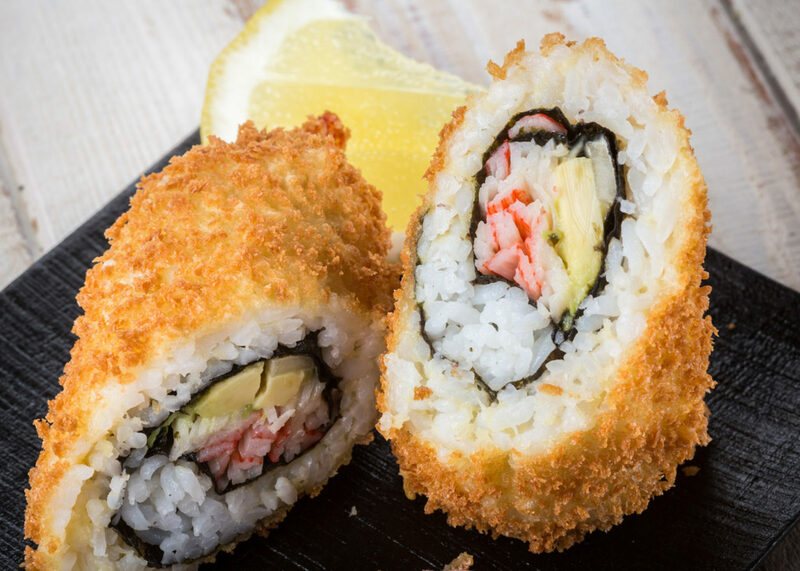 It helps to spoon tempura batter over the roll while you are frying it because when you dip it at first it kind of soaks into the rice and isn’t quite enough. You will have to flip it quite a few times while you are cooking it, putting a little more batter over it each time. Cut the rolls in half diagonally. Drizzle eel sauce over it and serve with wasabi, shoyu, and ginger (if desired). Enjoy! Mmm, yummy, I love eel sauce and this combination sounds delicious. Ouch!!! Glad to hear it’s healing nicely but still, ouch!!! I am not a big fan of sushi but I do like looking at them.. However, this roll makes me crave for some Crazy California Roll. I would like to make some but am too scared to try and make it. Laureen – Aww don’t be scared! 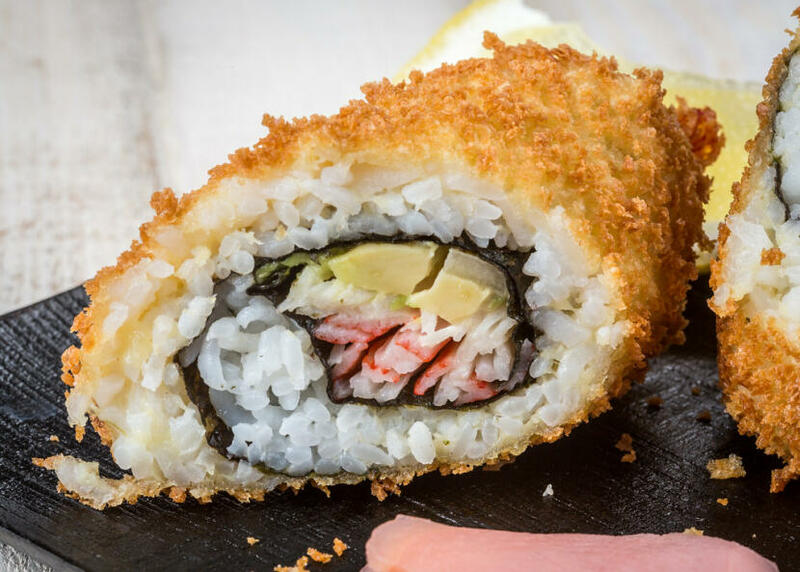 The roll is completely worth the risk of frying. 🙂 As long as you don’t drop the roll in the oil and make it splash and perhaps wear long sleeves just in case there is any spattering, you should be fine! This roll sounds great. It is very similar to a roll that my regular sushi chef makes that he calls his Phoenix Roll. Basically he takes a tuna roll that has tuna and avocado inside then he lays salmon on top of it and tempura frys the outside very lightly. Once fried he tops it with yummy eel sauce. Eating it while it is warm and crunchy on the outside buy almost melty on the inside is pure joy. Fortunately, I found ur website here. Very helpful. Keep cooking sushi or whatever !! You’re great !! Mmm-mm. W/Spring on the front porch (finally!) I find myself enjoying the kitchen again (winter no springy) and, being the sushi lover I am.. happily found this website. Couldn’t figure out an easy way to wrap an inside-out roll – duh! So thx for that! In return, I was going to give to you.. ‘easy way no cut finger’, however, I see Tim beat me to it. The only thing I would add is that after you’ve carefully cut avocado in half, hold the half w/seed.. Securely in one palm, and whack a little harder. Only other thing I can think of is that your heavenly green fruit is not as ripe as I like it to be. Be careful! Now, I have to go roll a roll. Glad to have been able to help! Yeah I was talking to my dad about the whole whacking an avocado thing, and he recommended using a heavier knife since I haven’t been able to whack the avocado harder… so hopefully that will help! Have fun making sushi! Those look delicious! And I love love love your shirts! 🙂 Thanks so much Sheri! I have never used the Sushi Magic device, but I’m not sure it’s worth the money to buy one. It’s pretty easy to roll sushi using the bamboo mat, and although your first few might not look perfect and may even fall apart (mine did! ), practice makes perfect! I’m sure you’ll get the hang of it. 🙂 Besides, it’s fun to practice, because more practice = more sushi for you to eat! Try using a spoon to pry out the avocado.. sometimes a knife works for me however my girlfriend does the grocery shopping without me sometimes and the avocados arent always so ripe.. I love your Blog or Site, its great. I teach Culinary Arts, I found some silicone sushi rolling matts that were better than the bamboo matts and easier to clean. Vicki – Yep, that’s a method I use quite often now. Rick – Thanks. I have seen the silicone mats, although I have never actually used one. I love your site and am so eager to try this out. About the pitting of avocados, I usually whack the pit with a knife and slide it off using a fork. I hope that helps. I also hope your hand gets better soon. Thanks! This is the only site that I found with the fried california rolls. This is an awesome site!! I have tried many different places in Irvine and I can’t say I have found any really good place for Asian Cuisine.